Hundreds of millions of citizens in the World are deprived of their fundamental rights, amidst the indifference of international institutions. These do not give the defense of Human Rights the right priority in their choices of international politics, which rather depend on economical criteria and political convenience. 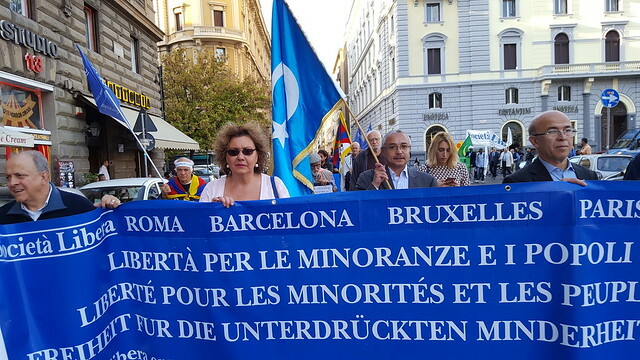 In order to denounce the situation of Human Rights, denied in more than a quarter of the countries on the Earth, the liberal cultural Association Società Libera, the Municipality of Campagnano Romano, the neighbouring Municipalities and the Communities of Oppressed Peoples living in exile: Venezuelans, Tibetans, Uyghurs, Cambodians, Iranians, Kurds, Laotians, Syrians, Harratins, Vietnamese, Armenians, Mongols, with the aim of shaking the public opinion of the West, will march silently on a stretch of the Via Francigena. A central importance will be attached to the issue regarding the persecution of Christian Communities; faced with a lack of reaction of many institutions, including ecclesiastical ones. This March will underline the symbolical knot that ties together the Freedom of Peoples and the historical role played in centuries by the Via Francigena, which is a symbolic route of community and freedom. The event will end at the Sanctuary of Madonna del Sorbo, where the representatives of the different Communities, Municipalities and organizations participating in the March will take the floor.